On a scale of 1-10, how much do I love Harry Potter? 9 3/4. Basically, long story short, in a nutshell, moral of the story is... I'm a HUGE Harry Potter fan. Going to the Making of Harry Potter tour was a must. Google maps said it would take a little over an hour to get out to Watford, the train station from which the Harry Potter shuttles leave. We rode the tube to Euston station and connected with a National Rail train that would take us to Watford, about 20 miles northwest of London. They don't post what platform your train is departing from until right before it leaves so everyone mills around in front of these displays to watch for the announcements. 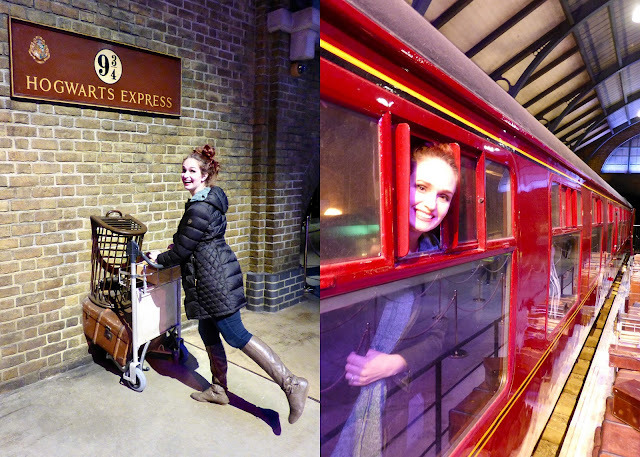 We arrived at the Watford station, found the Harry Potter bus, and rode about 10 minutes to the actual studios. From 1939-1994, the studios were known as Leavesden Aerodrome and functioned as a local airfield and factory. Back in WWII the plant produced fighter planes and later continued making Rolls-Royce aircraft engines. After the factory closed down the buildings were transformed into soundstages, workshops, backlots, and dressing areas for film production. In 2000, the Harry Potter movie team descended on the Leavesden studios to begin more than a decade of production on the film series. Now, the Warner Bros. 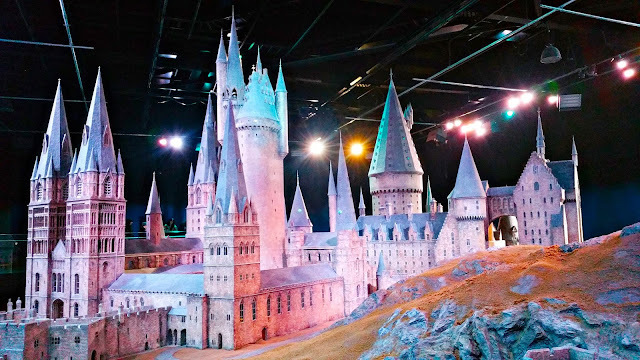 Studio Tour London - The Making of Harry Potter (the official name) preserves and celebrates the magic behind the movies at the actual location where they were made. We hopped off the shuttle bus, got our tickets, passed through security, and entered. The complex is made up of two main soundstages, named J and K (get it? ), with a couple cafes, souvenir shops, and the backlot. The gift shop was so cool. Here is the Olivander's Wand Shop section with hundreds of exact replica wands from all your favorite characters. Also for sale were facsimiles of many of the posters and things designed for the movies. The film's graphics department created hundreds of thousands of posters, ads, flyers, newspapers, and even 25,000 pages of The Quibbler. The line to begin the tour wound by Harry Potter's room under the stairs - the smallest set made for the movie. NEATO! After a short introductory film, we got ready to enter the Great Hall. Insert famous Harry Potter theme music here! Dooo-do-do-dooo-do-dooooo-dooooo. Props on the house banquet tables. Though it was rarely seen on screen, prop makers loved the house point counter which contains thousands of glass beads. One of the original sorting hats and stool. "Gryffindor!!!!" Costumes for Professor McGonagall, Dumbledore, and Snape (RIP Alan Rickman. "Always.") with the owl podium. The podium was covered in real gold leafing and years of melted wax. Costumes from the Yule Ball in film 4. Hermione's dress is so pretty. In just over a month, 90 decorators transformed the Great Hall set into a ballroom of silvery ice and snow, complete with faux ice sculptures. Leaving the Great Hall set you enter the first of the two huge sound stages that now display sets, costumes, and everything else from the movies. This is one of the make-up artists' table. Zooming in on one of Harry's lightning bolt scars! The Gryffindor boys' dormitory where Ron, Harry, Neville, Seamus, and Dean shared a room. The small circular shape of the room was supposed to symbolize this was a place Harry would feel at home. The beds were made for the first film, but as they actors grew the beds became much too small so they had to curl up to keep their legs and feet from dangling over the ends during shooting. J.K Rowling suggested that each wand should reflect the personality and characteristics of its owner. 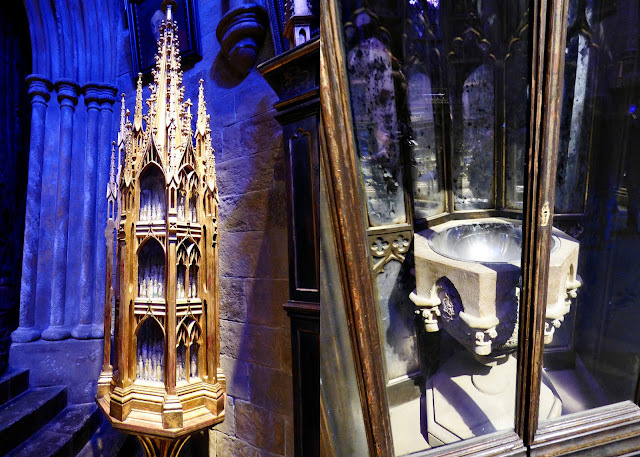 Over the course of the films, more than 3,000 wands were made using combinations of wood, plastic, resin, and rubber. The set decoration department chose tapestries and furniture for the Gryffindor common room to prominently feature the house colors of scarlet and gold. 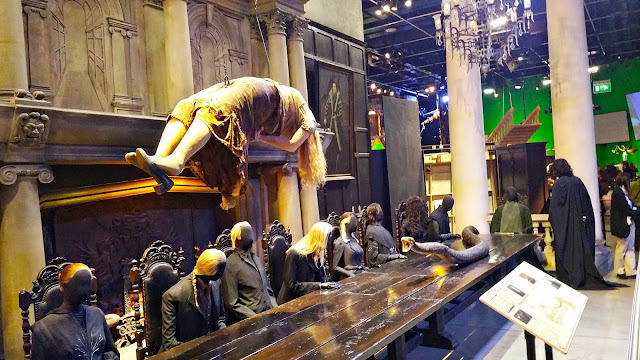 In the background you can see Harry and Ron costumes from film 3. 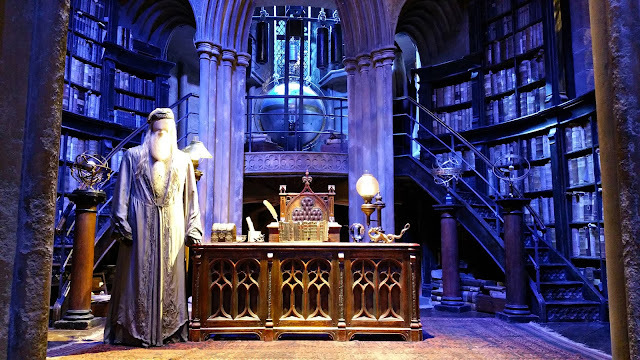 One of the coolest parts was the set for Dumbledore's office. The office was a series of overlapping circles rising as the office went back. The hundreds of books are actually British phone books re-bound in leather. The memory cabinet filled with more than 800 tiny, handmade and hand-labelled vials and the Pensieve. Dumbledore's fascination with the universe and skies became the room's defining feature. The shelves glitter with old microscopes, telescopes, star charts, and astronomical devices. 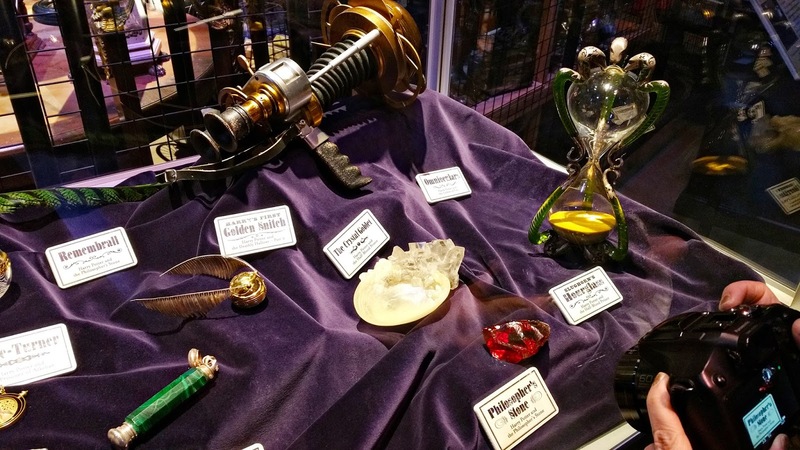 Props on display including Omnioculars, a Golden Snitch, the Philosopher's/Sorcerer's Stone, the crystal goblet from film 6, and a Deluminator. More and more props. It was fascinating looking at all this. Such craftsmanship and artistry! Optical illusion set to make a short piece look like a long hallway. 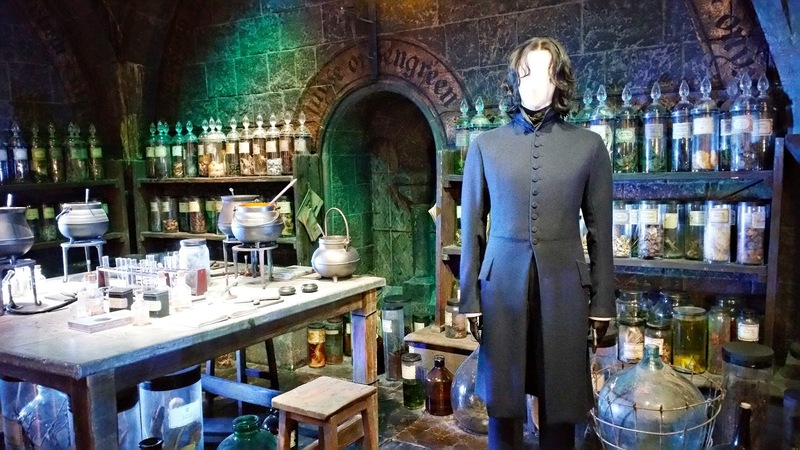 The potions class room with one of Snape's costumes. The art department designed this room to appear as though it were in a dark, underground corner of the castle. Brass-leafed archways were inscribed with the Latin and English names of potion ingredients and rare minerals, all selected from ancient alchemy recipes. Some of the hundreds of portraits painted for the film. Many of the subjects are workers from the film in period costume. Hagrid's Hut. Two scales of the set were made, a small one to make some character look "regular" size, and a smaller set to make Hagrid appear like the half-giant he is. It was designed to look like Mr. Weasley had built it all so no wall was at a right angle and every surface was deliberately sloped. The Horcruxes: Tom Riddle's diary, Marvolo Gaunt's ring, Slytherin's locket, Ravenclaw's diadem, Hufflepuff's cup, Nagini the snake, and Harry himself. The super creepy Malfoy Manor set complete with a bound and suspended Charity Burbage being tortured. The Magic is Might sculpture from the new and un-improved Ministry of Magic. One of my favs: Professor Umbridge's office at the Ministry of Magic. Between the two sound stages was the King's Cross station Platform 9 3/4 set and the Hogwart's Express. Originally shot on location in London for the first 7 films, for the last movie they recreated part of the station and platform here in Leavesden. Off to Hogwarts! | On the Hogwart's Express. The train consists of a GWR 4900 Class 5972 Olton Hall locomotive and tender pulling several customized British Rail Mark I carriages. Harry and Ron enjoying treats from the snack cart. The costumes from the last scene. The display cases of the graphic design department's work were so cool. Book covers, Quidditch tournament programs, wanted posters, and more. You never really think about how much work goes into making a film until you see things like this on display! "That's so funny." I think I said that a thousand times while we were looking around. It was just so funny to see all these things IRL. Before heading out to the backlot and into the second sound stage, we stopped at the cafe for lunch. 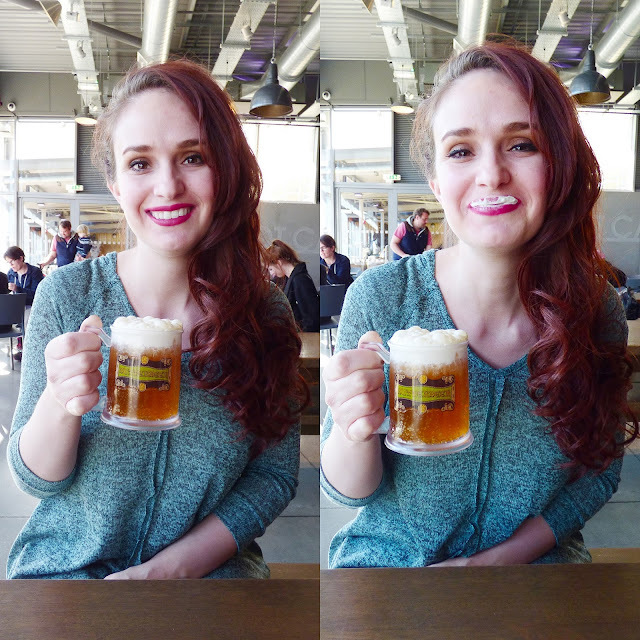 Of course we had to try the famous butterbeer! Delish! We decided it tastes like Werther's Original candy. Then it was out to the backlot which includes Privet Drive! For the first film, the exterior of the Dursley's house was filmed in Bracknell, Berkshire, England. For the rest of the movies the filmmakers decided to recreate the street on the backlot. The Knight Bus is 22-feet tall and was created from pieces of three vintage London double-deckers. Though it was never in the books, the now iconic Hogwarts Bridge was first featured in film 3. Only one section of the bridge was ever built and the visual effects department created the rest using CG effects. Another highlight was the intact Diagon Alley set! 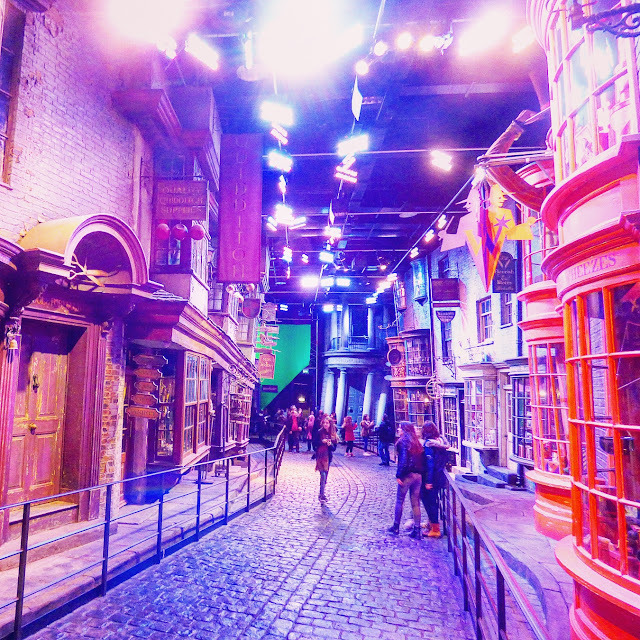 The set constantly changed throughout the movies. Walls shifted, shop fronts moved, and entire buildings have been tweaked to lean just right. The street was designed with many of the details from the books and inspired by the streets of London described in the works of Charles Dickens. We also got to see cool models and drawings made that they used to figure out the set pieces. Then the grand finale: Hogwarts castle! Built for the first film, the 1:24 scale model was used in every movie with the towers, courtyards, and turrets being digitally enhanced to create the views seen in the films. Then it was back to the shop and the end of the tour. We spent over three hours there and loved every minute. It was a fascinating experience. 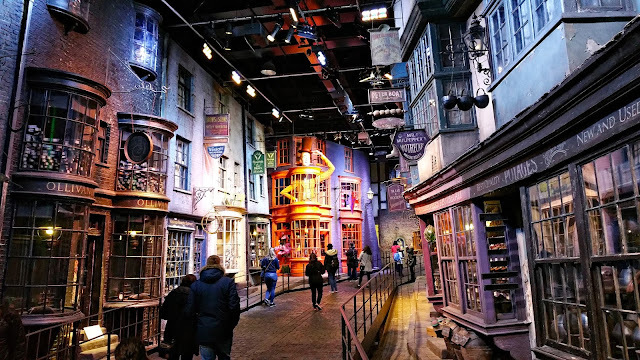 If you are a Potterphile, it is more than worth the trip. 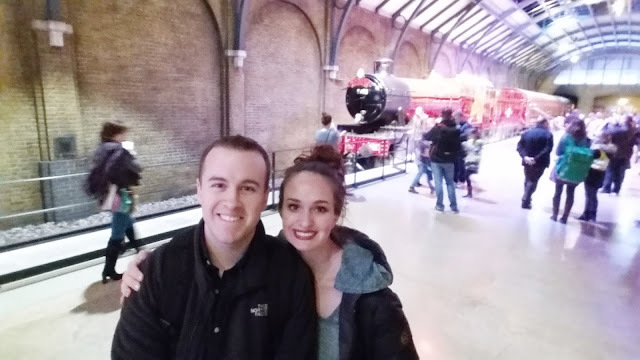 Still riding the Harry Potter high, we traveled back into London and went straight to the real King's Cross Station. Photo op at the station! That is seriously amazing! Seeing all of those sets and costumes together is just really stunning to think of all of the work that went into those. Sooooo jealous!!!!! I would LOVE to visit there!!!!!!!!!! So cool! I kinda boycotted Harry Potter when he first became popular, because the targeted audience of 4th grade readers, in my opinion, is WAY TOO YOUNG! I was teaching at the time, and every one of my students was far too young, but my oldest son is now in the 7th grade. So, I became familiar with the stories and movies and am hooked. So is he! We love Harry Potter! Thanks for sharing all these fabulous photos! Wow! That looks amazing. Definitely adding it to my bucket list. The books and movies are my all time favorite. Thank you so such for sharing your Harry tour! I have loved the books. Ms Rowling's stories are wonderfully entertaining, then the movies brought them to life! I was concerned what the stories were teaching our children, til my grandson said "Gramma, it's just a story. Read the book." So I did, and couldn't stop, I have all the books, (digital) and the movies too. And I am 66 years young! Thanks for making me want to go to London, even more. Oh and my fav character, Snape of course...Always! this is so cool!! Need to come back and look at these pictures some more. I WOULD love to do this. Thanks for sharing!!! 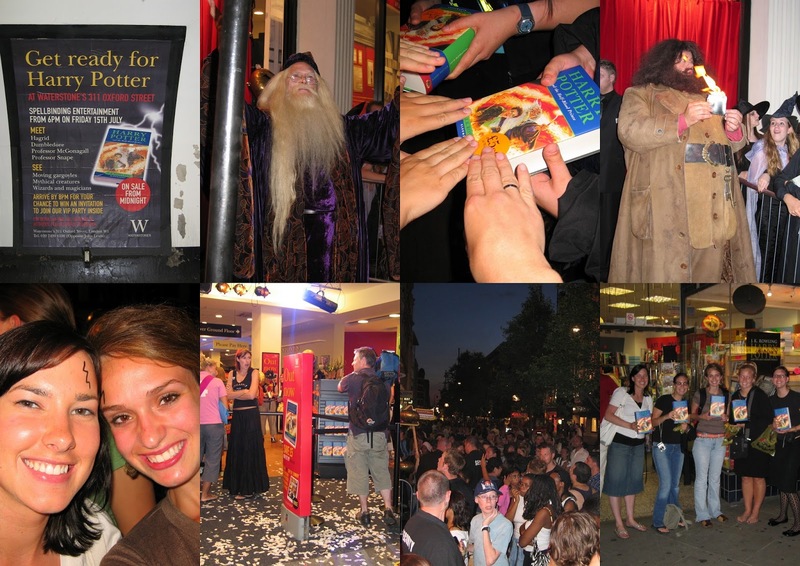 I am so glad you shared this Harry Potter experience. My oldest is a HUGE Harry fan and is dying to go to London before he heads back to the states this summer. Now I am definitely considering a trip for his graduation and a tour of the Harry Potter set/studio. He would just love it!